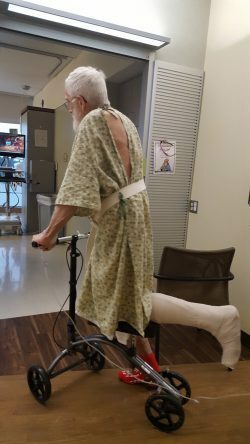 Little did we think that Nyel would be reverting to childhood in quite this way but… Yesterday, the physical therapist brought him a knee scooter to try out and on Tuesday good old UPS will be delivering an All-Terrain KneeRover Steerable Knee Scooter! Color: blue. No tools required for assembly. “Is this hallway slanted downhill?” he asked. And we laughed. Up and down the hall he went like a kid with a new toy! It was the highpoint of this hospital episode for sure and, when he got back to the room and settled into bed, he immediately asked for his cell phone. Amazon.com will be providing Nyel with an early Christmas present. Among other things, if the customer reviews are to be believed, he should have no trouble going down to the chicken coop and back. Wow! Being a one-legged farmer shouldn’t slow him down a bit! 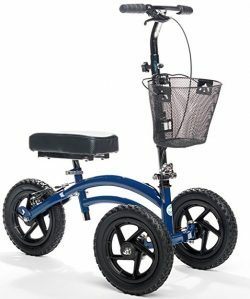 I was hoping that Nyel would be a candidate for one of these knee scooters! My daughter used one for several months after foot surgery and it made life so much nicer for her than having to use crutches. I hope Nyel lets you take it for a ride! And give him my best wishes for a speedy recovery for him. So glad he is coming home. I told Phil yesterday about his fall. We were discussing this scooter the other day! Glad he can use one eventually. Meanwhile, don’t you wear yourself out pushing, pulling, transferring, etc. , Sydney!! We’ll continue our prayers for both of you! ?? So happy for this news.